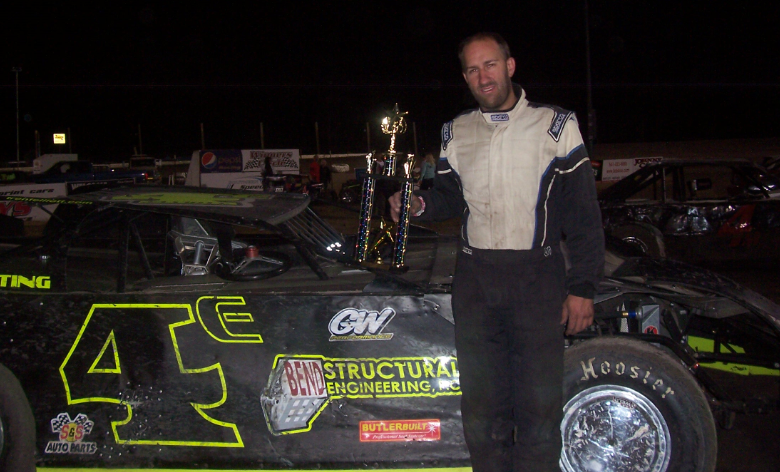 Trent Elliott #4e made his first visit of the year and won the Late Model Main Event. White City, Oregon...September 15...Trent Elliott rebounded from a heat race crash to win the 20 lap Late Model Main Event Saturday night at Southern Oregon Speedway. Elliott chased new track champion John Dees down and passed him in Turn 3 of the eighth lap for the lead. Elliott stretched his advantage to nearly a half-lap at the checkered flag. Dees used his fifth second place finish of the season to win the division championship. Miles Deubert finished third in the feature, followed by Dave Foote and Kevin Putnam. 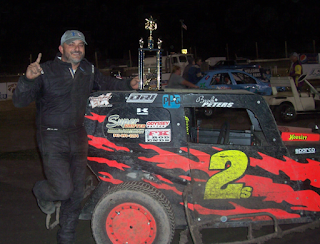 Brock Peters #2 won his second SODCA Dwarf Car Main Event to move into second in the standings. Brock Peters won his second 25 lap SODCA Dwarf Car Main Event of the season. The two-time champion led from the start and fought off an early challenge from Josh King. King repelled a serious late race challenge from A Dash winner Kalvin Morton to finish second as B Dash winner Joe Sanders and Chad Cardoza rounded out the Top 5 finishers. Josh King emerged with his third SODCA Championship. Eric Aos #66 won his third Valley Store All Late Model Lites Main Event of the season. 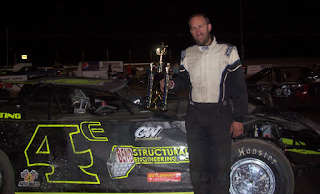 Eric Aos won his second straight 20 lap Valley Store All Late Model Lites Main Event and third of the season. Aos led from the start with new champion Charlie Eaton in close pursuit. On lap 13, the two cars touched exiting Turn 4, and Eaton backed off. Aos led the rest of the way with Eaton a close second ahead of Greg Arnold, Jim Cunningham and Dusty Aos. 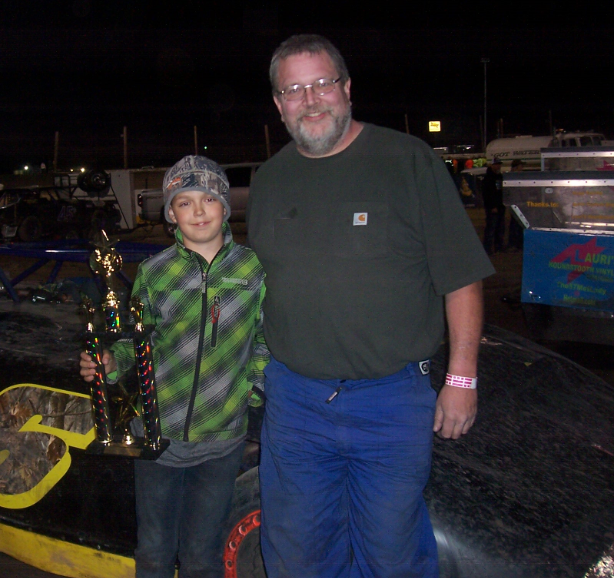 2015 Bobbio's Pizza Mini Stock champion David Marble #4m returned and won the Main Event. 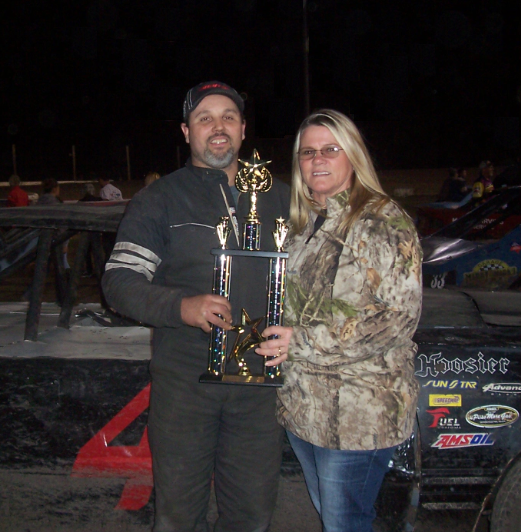 David Marble returned to the Bobbio's Pizza Mini Stock division and won the 20 lap Main Event. Marble is the IMCA Sport Modified point leader and the 2015 Mini Stock champion. Marble led from the start. Tim Cunningham started last in his Mini Outlaw and managed to take the lead from Marble on lap 15. However, he fell off the pace a lap later as Marble resumed command all the way to the checkered flag. New division champion David Steele finished second ahead of Trophy Dash winner Hunter Magnan, Gary Anderson and Ashtin Hedges. Brandyn Wonsyld #7 won his fourth JOAT Labs Hornets Main Event Of The Season. Brandyn Wonsyld won his fourth JOAT Labs Hornets Main Event of the season. Wonsyld led from the green flag and won the non stop event by a full straightaway. Bree Tritchler gained second from Jenna Hedges on lap 17 and would finish there for the fifth time this season. The finish earned Tritchler the division championship. Dylan Sauer finished third, followed by Jenna Hedges and Trophy Dash winner Dylan Irving. Racing season concludes next Saturday night with Championship Night #2. The IMCA Modifieds will be there along with the Kendall Oil Winged Sprint Cars, IMCA Sport Modifieds, Calculated Comfort Outlaw Pro Stocks and OTRO Hardtops. For further information, go to www.southernoregonspeedway.com. Heat Winners (6 Laps)-John Dees, Miles Deubert. Trophy Dash (4 Laps)-John Dees. Main Event (20 Laps)-Trent Elliott, John Dees, Miles Deubert, Dave Foote, Kevin Putnam. Heat Winners (6 Laps)-Kalvin Morton, Brock Peters, Camden Robustelli. A Dash (6 Laps)-Kalvin Morton. B Dash (8 Laps)-Joe Sanders. Main Event (25 Laps)-Brock Peters, Josh King, Kalvin Morton, Joe Sanders, Chad Cardoza. Heat Winners (6 Laps)-Hunter Magnan, David Marble. Trophy Dash (4 Laps)-Hunter Magnan. Main Event (20 Laps)-David Marble, David Steele, Hunter Magnan, Gary Anderson, Ashtin Hedges. 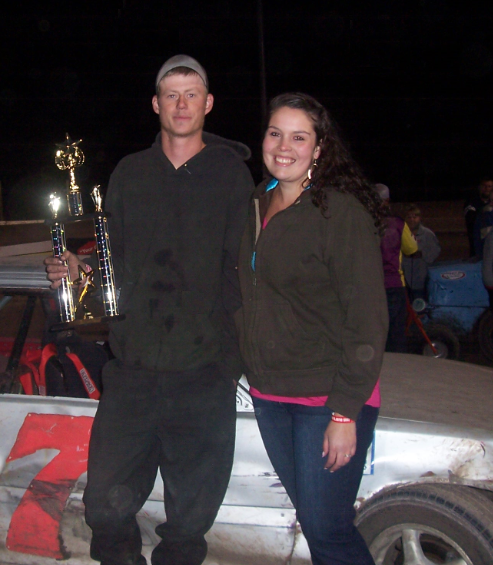 Heat Winners (6 Laps)-Brandyn Wonsyld, Jenna Hedges. Trophy Dash (4 Laps)-Dylan Irving. Main Event (20 Laps)-Brandyn Wonsyld, Bree Tritchler, Dylan Sauer, Jenna Hedges, Dylan Irving. Heat Winner (6 Laps)-Charlie Eaton. Trophy Dash (4 Laps)-Charlie Eaton. Main Event (20 Laps)-Eric Aos, Charlie Eaton, Greg Arnold, Jim Cunningham, Dusty Aos.